Toyama City (富山) is the capital of Toyama Prefecture in the Hokuriku Region of northern Chubu. Toyama is conveniently connected with Tokyo and Kanazawa via Shinkansen (JR Hokuriku line), and is one bus ride away from Shirakawago. The city is also a popular gateway for visitors to the Tateyama Kurobe Alpine Route. If our plan went as desired, we would’ve stayed in Toyama one night. Between the lack of information in English and the popularity of the Shirakawago Winter Light-Up event, we quickly ran out of an option to stay in Toyama. Regardless, we decided to make a day trip to Toyama from Kanazawa. Disclosure: This article contains affiliate links. If you purchase by clicking these links, I may receive a small commission, at no additional cost to you. Click here to read full disclaimer. Part 4. Things to Do in Toyama in One Day ? I was surprised to find that many international direct flights from Seoul, Shanghai, Dalian and Taipei are available in addition to domestic flights from Tokyo, Kyoto, Nagoya and Sapporo. Once we arrived, we bought a one-day tram pass (Adult 620 yen; Children 310 yen) at the JR Toyama Station. As our goal was to cover as many places as possible on the same day trip, it made the most sense, given each ride is 200 yen. You can freely hop in and out of the tram by showing your pass. Toyama City offers complimentary tram tickets to international guests who stay in the city. While I don’t know details about this offering, it’s worth to ask your hotel for availability. If weather permits, riding a bike would be a great way to explore the city. One-day Bike Rental Pass is available at 150 yen (plus 350 yen deposits) for the 24-hour ride. There is no extra charge if each ride is no longer than 30 min. No limit for the number of trips. City tour buses is another convenient way to explore the city. Each ride is 200 yen (100 yen for children). With a one-day pass, you can ride both bus and City Tram. The fare is 700 Yen (350 yen for children). Toyama is one of the popular destinations for travelers to stay to tour the Hokuriku region. Especially if you are heading to the Tateyama Kurobe Alpine Route, it’s best you find accommodations in Toyama the night before. 1. Don’t confuse Toyama City with Toyama Prefecture. Although Toyama is a city within Toyama Prefecture, they are not to be confused. When researching in English, I couldn’t find much about the city. Making things worse, a handful of information available was confusing. Make sure the attractions or accommodations are indeed in Toyama City. Unless you don’t mind traveling outside of the city, quick Google mapping will save you from a headache later. 2. Time is of Essence. If you’re thinking about traveling from Toyama to Shirakawago, book as earliest as you can, especially for the Shirakawago Winter Light-Up event. Due to the limited accommodations available in Shirakawago, many festival goers stay in Toyama for its convenient location. Toyama hotels sell out quickly. To book your stay at Toyama Hotel, check availability and rates here. The snow-covered Toyama Castle and its walls made such a beautiful scene. It probably would have been a 3-min walk from the tram stop, but we took our times to take photos and played with the snow. Toyama Castle was built in 1543 during the Edo Period by the Maeda clan. While I heard that there is Toyama Castle History Museum with an observation deck inside the Park, we didn’t go into the castle. Maybe a good spot for a history buff. We were more into enjoying the scenery that day. The pond in front of the Sato Memorial Art Museum was completely frozen. Because of knee-deep snow that blocked the view, we almost missed this beautiful Japanese garden. Thankfully, someone already dug out a small path, making it easier for us to peek at the frozen pond. Continuing to walk towards the back of the Toyama Castle, we reached the Matsu Riverwalk Sculpture Park. This is the home for five hundred cherry trees, blossoming in both sides of Matsu River in spring. In the cherry blossom season, Matsu River Boat Cruise is a popular activity. During our visit in winter, these trees were completely covered in snow. Also buried in the snow, sculptors were barely noticeable. Regardless, it was a beautiful place to walk. Few footprints on the snow were the only indicator someone had been there. I loved the fact that no one was around. Without the surprisingly loud sound of snowfall from trees, which startled me, I enjoyed hearing my own footsteps on fresh snow. As we walked out of the Toyama castle park, heavy snow started to fall. Toyama felt colder than Kanazawa. If it wasn’t for the weather, we probably could’ve walked to our next destination — Toyama Glass Art Museum. But we took a tram and got off at Grand Plaza Mae. Toyama is known for its glass art. So it’s only natural for the city to have the Glass Art Museum. Designed by a world-renowned architect, Kengo Kuma, the building itself is modern and artistic. I particularly liked the high-ceiling windows and wooden bar structure. I’m not sure if that’s what the architect intended, but the wooden bar panels reminded me of Kaikaro Teahouse in Kanazawa, which featured classical chaya architecture called kimusuko. (Read more about my visit to geisha houses in Kanazawa here.) Even on an overcast day, there was no shortage of natural light inside the museum. And we could look out the window to enjoy the romantic snowfalls. My favorite exhibit was the “Glass Art Garden” by Dale Chihuly on the sixth floor. His glass artworks are colorful and vivid. It got carved into my mind. We dined at the Cafe on the second floor for convenience. I forgot the name of my dish in Japanese, but it essentially was vegetarian tonkatsu (pork cutlet). The food was decent and beautifully presented. Hours: 9:30 a.m. - 6 p.m.
Toyama is historically a center for traditional medicine. Ikeda Yasubei Shoten is a Japanese traditional medicine shop that has been practicing medicine since 1936. Since it’s only one block away from the Glass Art Museum, we decided to stop by. Here, you can get counseling and purchase traditional medicines for constipation, vitamins, etc. The shop also demonstrates how Japanese pharmacists traditionally made drugs on the old-fashioned machine. Translated brochures are also available for non-Japanese travelers. I honestly wasn’t too impressed with this shop. The whole environment made me think it was a bit too gimmicky to be authentic. But I liked to see the not-so-traditional medicine packages on display. Maybe for a more authentic experience, Kokando traditional Medicine Museum would have been a better choice. We took the CENTRAM, a.k.a. City Tram Loop Line, to circle back up north to go to Toyama City Hall Observation Tower. Once we got off at the Sakurabashi stop, we didn’t see any high-rise building that resembles an observation tower. All we could see was just snow-covered white trees. And nobody to help us! We spotted two high school girls and asked for directions. They didn’t know where the City Hall was. But Google Map came in handy! While we were a bit too disoriented to even look for directions on Google, the girls were familiar with the area enough to immediately recognize the direction on the map. After walking for five minutes through snow-covered trees, we finally found Toyama City Hall. If you were expecting some sort of skyscraper, as we did, you wouldn’t imagine this building would have an observation deck. Once inside the City Hall, we took the elevator up to the Observation Tower. The city operates it, and admission is free. It’s not a big fancy tower, but you can see the entire town 360 degrees without any obstruction. We took another tram back to JR Toyama Station to visit the Fugan Canal Kansui Park. On a good weather day, the waterside park is a 10-min walk from the station. There is also a local bus departing from the Toyama station. However, we decided to take a taxi to save us from the trouble walking on an icy road. Locals come to the Kansui Park to stroll along the canal. Fugan Canal Cruise runs from April to November, taking tourists to Nakajima Lock and Iwase along the cherry blossom route in Spring. We chose to stay warm inside the Starbucks as it was getting dark and very chilly. Generally speaking, I prefer to visit local independent coffee shops when traveling; however, this Toyama Starbucks along the canal walk is unique. The coffee house is housed in a stand-alone glass building overlooking the Heaven’s Gate Bridge (Tenmon-Kyo) and the Kansui park. Although it was a bit crowded, sipping a cup of warm coffee with the view of the lighted bridge and its reflection on the water on a snowy day made our evening very romantic. What a perfect way to wrap up our day trip! Tip: Book a taxi for a return to JR Toyama Station. We asked our taxi driver to come back in an hour for us. It is not easy to grab a return taxi from Fugan Canal Kansui Park. The Tateyama Kurobe Alpine Route passes through Mt. Tateyama in the Japanese Alps, and is one of the most popular things to do in Toyama. Unfortunately, we missed this because the famous snow corridor is entirely closed in winter (i.e., from December to mid-April). After my initial research on what to do in Toyama, I saw a photo of travelers walking in between 20-meter-high snow walls (“snow corridor”). How cool is that? I wanted to book the trip right away! To my disappointment, I learned that the snow corridor in the particular section of the Tateyama Kurobe Alpine Route is only open during late spring, approximately April - June. Would you have expected to see 20-meter-high snow walls in late spring? The full course of Tateyama Kurobe Alpine Route between Toyama and Omachi (Nagano) is open from April to November. Private vehicles are not allowed to enter. You can travel each section of the route by various means of designated transportations - train, cable car, trolley bus, etc. Check the open dates of the Tateyama Kurobe Alpine and purchase advance tickets here. For your planning, it will make the most sense to take advantage of the luggage forwarding service because your journey will end in Nagano once you travel from Toyama to Omachi through the Alpine Route. In other words, instead of planning to go back to Toyama, arranging your accommodation in Nagano would make your trip more efficient. Also, don't forget to dress appropriately. Although you might enjoy the cherry blossoms under the pleasant sunshine in Toyama City in late spring, you will need to pack winter gear on the snow-covered mountain. 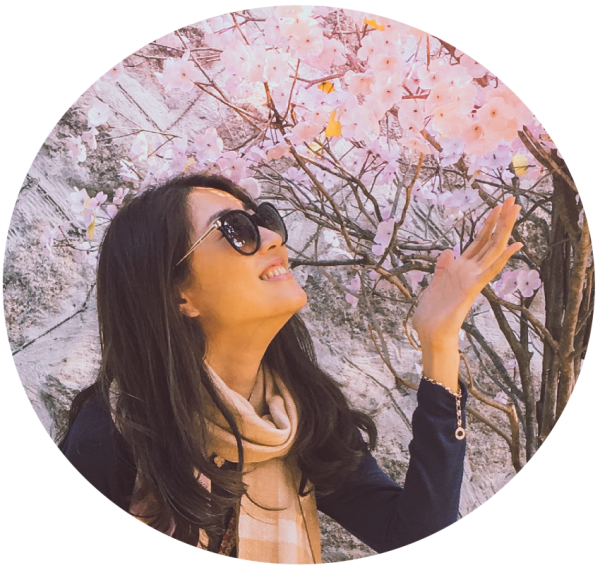 Check out what to wear in Japan in winter here. 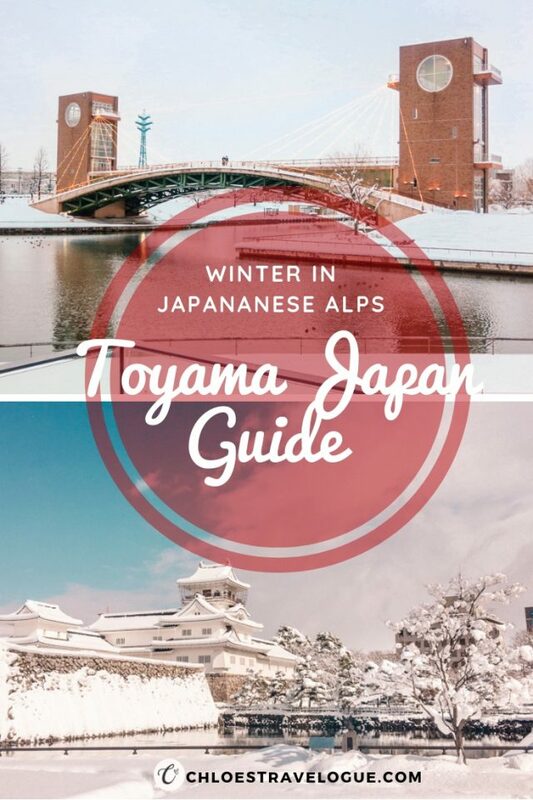 ***Winter in Toyama City does sound romantic, doesn't it? ENJOYED THIS POST? PIN IT!